IVAR packs being put to use across Southern Africa. Achieving personal mobility is awesome, but sometimes you've just got to carry stuff too. We've gotten more than 16,000 Africans rolling on bikes so far, but moving stuff around with them on those bikes remains a challenge. Rack and basket compatibility is tough, and there's not a good supply of donated or inexpensive trailers. We've seen some amazing examples of pure African ingenuity to solve this problem - and another solution is as simple as a backpack! Not only do our friends over at IVAR have the coolest and most comfortable backpack design on the market, they also share our soft spot for Africa and our belief that clean, green, individual transport is a no-brainer. With their donation of more than 800 backpacks to our projects, IVAR packs are making a huge difference. Just last week, we visited the shop in Gaborone, where Sparks, our legendary mechanic, showed up for work sporting an IVAR pack. Sparks says it's the most comfortable pack he's ever worn. They're also being used in other parts of Botswana, as well as Namibia, Zimbabwe and Lesotho. Huge thanks to IVAR for their generous support, and for helping everyday Africans make their newfound two-wheeled freedom more productive and more comfortable. The Harare Crew is back, this time with reinforcements. Our guys up in Harare have distributed their entire last batch of bikes, and they showed up again one early morning last week for more. 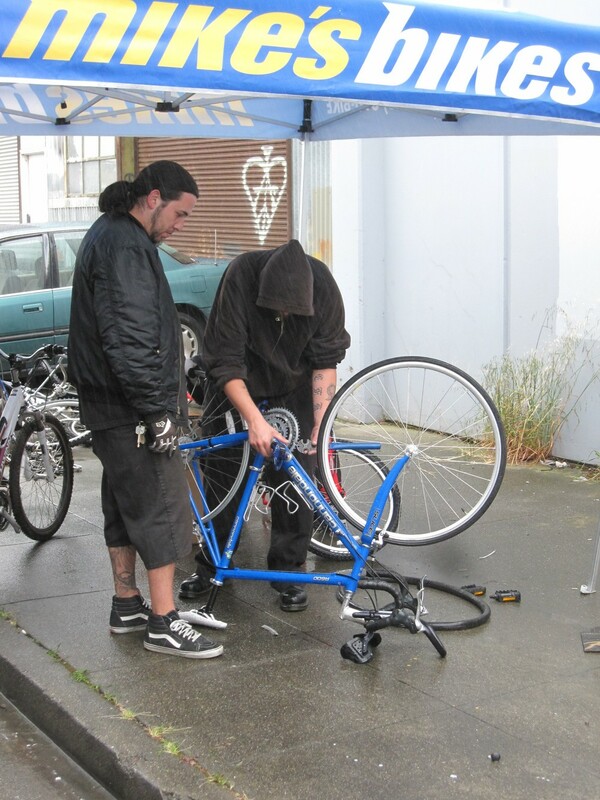 But this time, they brought two new additions, friends of theirs eager to set up their own small bike shop businesses. So along with Enoch and Lovemore, we now welcome Gift and Charles, who are also making the 15 hour bus journey from Harare to Gaborone to pick up their own supply of donation bikes, strap them to the bus, and log another 15 hours home to Harare. 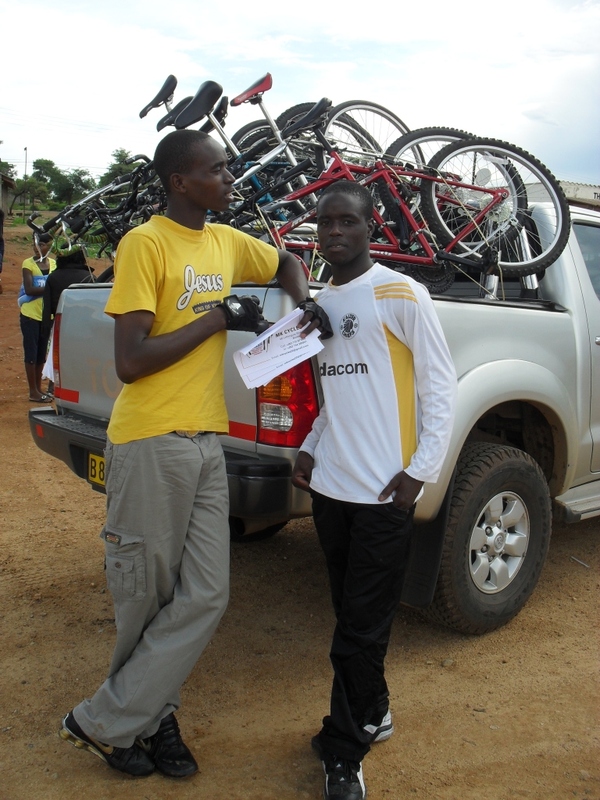 We really like working with these hard working guys, and we're thrilled to be landing so many bikes in Zimbabwe. Click here for a map of their 1000km journey. Loading bikes into the GMR truck to bring to the bus station. Loading up for the long trek back to Harare. Enoch with his new stock and slips from our bike donors in California. Refine with his new stock and slips from our bike donors in California. Charles with his new stock and slips from our bike donors in California. Lovemore with his new stock and slips from our bike donors in California. L to R: Enoch, Lovemore, Paul (Cupcake), Refine, Charles. We've worked really hard to identify, vet, train and set up proper Sister Shops across the region, but sometimes great partnerships just land in your lap. Meet Lovemore and Enoch, two guys from Harare who heard about the availability of bikes down in Gaborone and are overcoming huge obstacles to give their community access. Once or twice a month, they spend more than 15 hours on the bus ride from Harare. They arrive at our warehouse in Gabs well before dawn and wait for Paul to show up. They then select 15 - 20 bikes each time, reimburse us right away for what we've spent on the ocean freight and duty, and then they strap the bikes to the top of another bus for the 15 hour ride home. They've got a good little business going, they're not afraid to work hard for it, and we're thrilled to have them as partners in Zimbabwe. Click here for the map of their 1000 km journey. Transporting bicycles through Africa is no easy task. 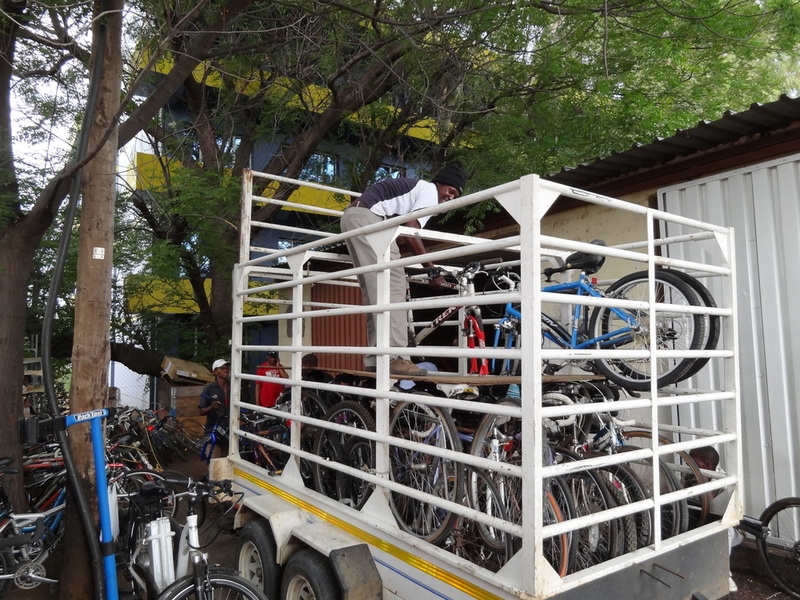 Milton (of MK Cycles, our Sister Shop in Zimbabwe) shares with us the details of the various interruptions he encountered while hauling 41 second-hand bicycles from Gaborone to Bulawayo. As I said, my trip back to Bulawayo with the bikes was an epic adventure of sorts. I had initially hoped to leave Gabz early on Friday morning, but when I showed up to collect the truck and trailer we discovered that The Beast didn’t have a "blue book" (vehicle registration) and that it was still registered to its former owner who had long left Botswana. At this point, we were really screwed! Then enter Jane; one of Rob’s finest in my humble opinion.. we quickly proceeded to misrepresent to the police and transport department (in the nicest and closest-to-legal way we could) that we had been sent at just that moment by the original owner to get a new blue book for her. And I guess our combined awesomeness was proof enough that we weren’t a pair of crims up to something dodgy and they signed our affidavits etc. and sent us on our merry way; blue book in hand!! Of course, it took most of the morning and a bit of the afternoon, but it was beter than the two alternatives (i.e. no trip or prison for presenting false info to the police). The next step was easy; getting the vehicle cleared by the police for international travel. This took us about two hours and at promptly 15:30 we were ready to roll. The driver (Washington) and I hooked the trailer to our trusty vehicle and proceeded to the filling station where we gave The Beast 76 litres of yummy diesel. This, as you would know, isn’t a problem if the car you are filling up has an actual diesel engine. The Beast, however, runs a 24 valve, 6 cyclinder petrol engine (clear proof that a tough manly exterior can be fueled by sweet fruity wines and ciders!!). We only had to drive two hundred meters before the error of our ways was clearly apparent. The Beast began to lurch violently and belch out thick plumes of white smoke. I then rushed back to the filling station to ask for a spanner and extra containers so we could drain all the fuel and called Terry and Rob and Steve and Boz to let them know what had just happened. To my surprise, no one reacted as though something cataclysmic had happened. But I was gutted. I had just wasted $100.00 of fuel , a few more dollars on the guys from the filling station who helped us out, nearly killed the car that Rob had freely lent to us, wasted Terry’s time and money on a mechanic (Terry came over with a mechanic to help us out and called a mechanic to make sure the car was fine) and wasted our own time all in one stroke. I spent much of the night mourning and obsessing over my careless mistake and mourning what it had cost. Fortunately, the plug on all Toyotas is easy to find but unfortunately, if you’re not a regular hand, it takes a bit of time to unscrew and also involves a fuel shower. Needless to say, three hours were spent correcting this unfortunate misadventure and at around 20:00 I had washed all the diesel away and we were once again on our way towards Zimbabwe. We drove steadily (read as very very slowly) because we knew we only needed to get to Francistown at 8 the next morning and we even stopped at 3am to catch some zzz’s. But at around five in the morning we had our first encounter with the police. We were stopped and promptly fined for driving a trailer without a registration disc. At the time, we must have been very very sleepy because we, too, looked for the disc but could not find it. But it was in fact hidden under the tarp we’d put over the trailer. And so we paid a BWP100.00 fine and pressed on towards the border. We passed through the Francistown without incident even though we had to stop briefly to refuel and rest. Unfortunately, we left without having breakfast because we overestimated the efficiency of our customs officials. We arrived at the border and around 8:30 and whisked through the Botswana side. At the Zim side, however, we were immediately presented with three challenges. 1. They refused to clear the car for entry because I was a Zim resident and the car was Botswana registered. This is despite the fact that we had stamped and certified letters giving me "authority and permission to use the vehicle anywhere in Botswana, Zimbabwe, south Africa and Namibia." 3. The staff at the border (clearing agents especially) aren’t the brightest of stars. We immediately set upon solving the only problems we could. We asked Terry to send us new versions of the letters of authority for the vehicle and proceeded to print and sign them on his behalf. And we also encouraged our clearing agent and Zimra staff to hurry up with a combination of smiles, threats, and long moments of time to let them work on our stuff. It may seem as though these are solutions which are easy to implement, but the fruits of our labour only materialized at 21:30 hours, when at last we got our paperwork and left the border for Zimbabwe. We were both totally famished at this stage, but mercifully we made it to Bulawayo a little after midnight (we were delayed at each of the three roadblocks by police hoping that the bikes had either been stolen or smuggled into the country). Having learnt from our first batch of bikes, I thought that I’d spend Monday doing inventory and catching up on MK Cycles news. I also thought I’d send my documents ahead so all the unnecessary delays could take place BEFORE we got there. And so we set off for Francistown on Tuesday morning to pick up our second batch of bikes and were twice stopped and fined for faulty brake lights on the trailer. We also stopped as we passed through the border to make sure our clearing agents received our paperwork. “I’ve been working on it,” the (silly) man said. When we got to F-town, there was driving rain and somehow one of the wipers on the car had packed up. And also, our contact had taken a road trip somewhere and it would be at least an hour and a half before he got back. So we passed away the time by having a healthy lunch and praying the rain away. As is the custom in Africa, our guy showed up two hours later and we spent a further 45 minutes packing the bikes. We arrived at the Bots border at around 18:00 and spent thirty minutes sorting ourselves out there and then proceeded to the Zim side where disappointment galore lay in wait. Not only had our clearing agent done very little, but he’d also gone home for the night and refused to come back and get our papers done. In a fit of rage, I promptly found another clearing agent who promised that he would work on our stuff quickly and charged us to be at the border at 08:00 the next morning. I left him my papers and the trailer at the border. The next morning, we were at the border looking for our shiny new clearing agent. We found him lounging around in his office. He then told us how he hadn’t worked on our documents because he was afraid of our old clearing agent. After I’d told him very roundly that if he said he’d do it and that I’d be unpleasant to both of them if he didn’t get himself into gear, he went to contend with our old foe; The System. He managed to tell The System that MK Cycles was at the border but he didn’t tell it that we were income tax registered (this error cost us $65.00 and cost him $50.00). At the sheer weight of his announcement, the system collapsed and the internet was rendered good for nothing other than Facebook. It returned at around 16:00 and finally we were told we were “free to leave” at 17:30-ish, but Zimra had questions for us first. For the next thirty minutes we were quizzed about why we bought second-hand bikes, why they cost so little, and finally, why the fonts on our last two invoices were different. They seemed satisfied and set to let us go, but them they had yet another question; "are you sure you have just 41 bikes in that trailer??????" By this time, all I wanted to do was do a Genghis Khan and fill a mass-grave with clearing agents and Zimra guys. But instead, Washington and I unpacked the trailer, counted the bikes and then reloaded them. This time we left the border at 22:30 and after the customary police stops, we were in bed at around 1 in the morning. Fortunately, The Beast braved this ordeal nearly as well as we did and only needed minor repairs, coolant, oil and regular drinks of the correct fuel. We returned him in one piece on Thursday….. So there it is, how I got all the bikes to the shop. Between now and the next time, I hope something changes to make it quicker and less costly. We were lucky enough to have Milton join us for our several days in Gaborone. He has an uncle who lives in Gabs and travels back and forth so he’s able to make the trip quite easily. It was great to see him and check in after his first year of operating. From the beginning, we knew Milton was special and we had high hopes for his shop. In the first year, he has not disappointed! He has successfully sold through his first container, and has been working closely with Rob and Terry of Bicycle Recycle to stay restocked. He has so far taken several additional bike deliveries from the Gaborone warehouse, and he combined his visit with us with a buying trip. He and Rob selected the 40 bikes from what remains of the last container, and we loaded “The Beast” for Milton’s return trip. He also has a previous 40-bike order waiting at the Zimbabwe border and will use the Beast to get those up to Bulawayo as well. He pays on time, and he is careful with what he orders – enough to service his customers, but not so much that he gets overloaded. He’s very happy to have good stock going into the holiday season, which, like everywhere else on the globe, is good for retail businesses. After getting the overall report, our first question was whether “Precious” ever got his bike. (Precious was our favorite Bulawayo police officer – find out more by reading back to the Zimbabwe posts from last year.) Milton confirmed that Precious had indeed finally saved up enough cash, and is currently the proud owner of a sweet new ride. All the other cast of characters are doing well - Big Mike is still helping out Milton with the more difficult repairs, and Milton his returning the favor by supplying him with spare parts. The Joiner did finally finish the shop and while we are still waiting for pictures, we hear it looks great. MK Cycles has done so well, in fact, that Milton came to us with a proposal to add new locations. He requested help in adding a store near Victoria Falls and one on the capital city of Harare. We all discussed it in detail over several days and decided to focus first on Harare because the market there is much larger and much more in need. It fits better with the mission of the Foundation to get bikes in the hands of Harare residents who really need them, rather than the tourists visiting Vic Falls. We’ll keep you updated as those plans progress, but we think Milton is poised for much success in his future. Filled to the brim with 480 donation bikes, container #9 has completed its 10-week journey to Gaborone, Botswana, and should clear customs in a few days. This latest resupply container represents a new direction in our model for distributing bicycles in Africa. In the past, one single Sister Shop has been the recipient of an entire resupply container, taking the entire cost of transport and customs into their overall financial plan. Some difficulties in this approach have been the high up-front cost for the Sister Shop, and a shortage of physical space to store such a large shipment of bikes. For our new model we've partnered with two avid cyclist brothers, both Kalahari Challenge competitors, who own a freight distribution company. They have agreed to store the donation bikes and send them out to our Sister Shops in 'as-needed' batches. This system of distribution offers many advantages for the Sister Shops and for the Mike's Bikes Foundation. First and foremost, the Sister Shops will be able to take delivery of inventory in smaller, more timely and more affordable batches, which eliminates the problems of lack of storage, slow resupply, and high up-front cost. Being able to forecast and plan inventories and expenditures accurately, the Sister Shops can now become more self-reliant and self-sustaining. 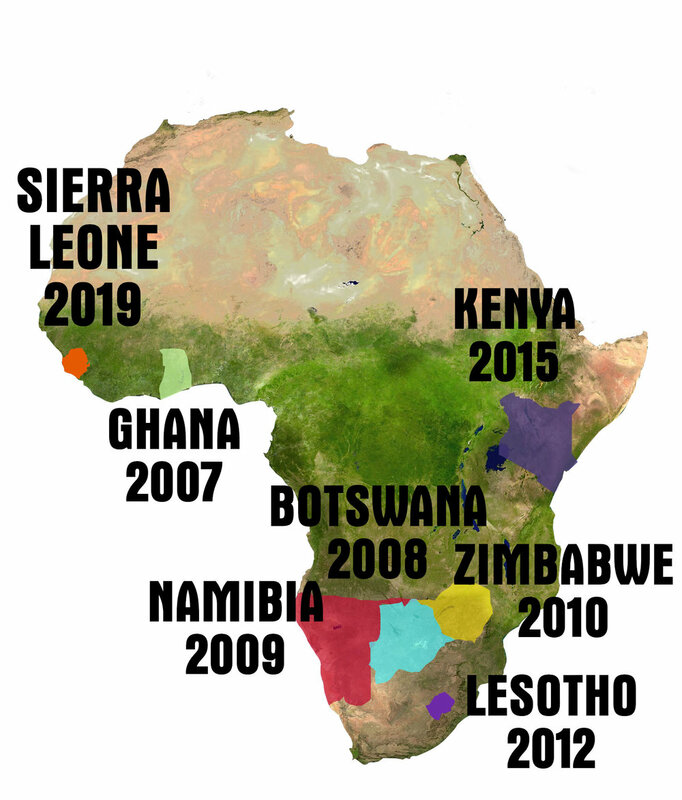 On our end, this method of distribution enables the Foundation to focus its attention on increasing bike donations in the U.S. and gives us more time to devote to our new project in Sierra Leone. Because the new system ensures that shipping costs get reimbursed, the foundation will be able to afford to increase the number of shipments annually, while still allowing the bicycles to arrive at the Sister Shops cheaply enough for them to be affordable for buyers in the community. In order to achieve the high-level goals of large scale distribution of bicycles in Africa and a widespread African transportation cycling culture, we need to speed up the flow of bikes to end users. The sooner we can scale distribution up, the sooner bicycle manufacturers will see opportunities to market their products and services in Africa. And with increased scale will come lower prices, enabling people in developing Africa to have a life-changing transportation option open to them. This new model is a leap forward in long-term sustainability for the Mike's Bikes Foundation Africa projects. To our knowledge, it is the the first distribution program of its kind. Nkulumo in his new Team Mike's Bikes kit hours before placing third in the Zimbabwe Nationals. Team MK Cycles, Team Mikes Bikes' Sister Race Team in Zimbabwe, received their team kits in the most recent Africa container shipment. The kits came just in time for the Zimbabwe National Race in Harare, where the gentlemen of MK Cycles put in a great showing. Out of a field of fifty competitors, Pk placed 7th and Nkulumo placed 3rd. Due to this performance, Nkulumo has been drafted to represent Zimbabwe at the All-Africa Games on the Zimbabwe National Team. The team, also known as the Zimbabwe Cycling Federation, first entered the international scene following team member Timothy Jones' successful run on the European and African racing circuits in the 1990s, and more recently, groundbreaking Zimbabwean mountain bike racer Antipas Kwari's participation in the 2008 Olympics. Nkulumo is very excited to go to Harare for accreditation this weekend, and he's thrilled to join such a prestigious African team. Congratulations to Team MK Cycles and to Nkulumo and Pk! They're Zimbabwe National champions today, and are Olympic hopefuls of tomorrow! The bikes filled one entire bay of our warehouse, from wall to wall. This year, we are really ramping things up with our Projects in Africa. We have an ambitious goal of sending FOUR 40-foot containers of bikes! The first container has already arrived in Sierra Leone for our new project there, a partnership with Village Bicycle Project which distributes bikes to rural villages. The second departed San Rafael on May 25, heading to Gaborone in Botswana. There, the bikes will be warehoused and parceled out in smaller, more manageable "shipments" to two of our Sister Shops, Jonmol Bicycle Service in Botswana and MK Cycles in Zimbabwe. Loading this second container was a bit of a challenge to say the least. We had less than four hours to load these bikes into a shipping container in the most efficient way possible, along with clothing, parts, and accessories. 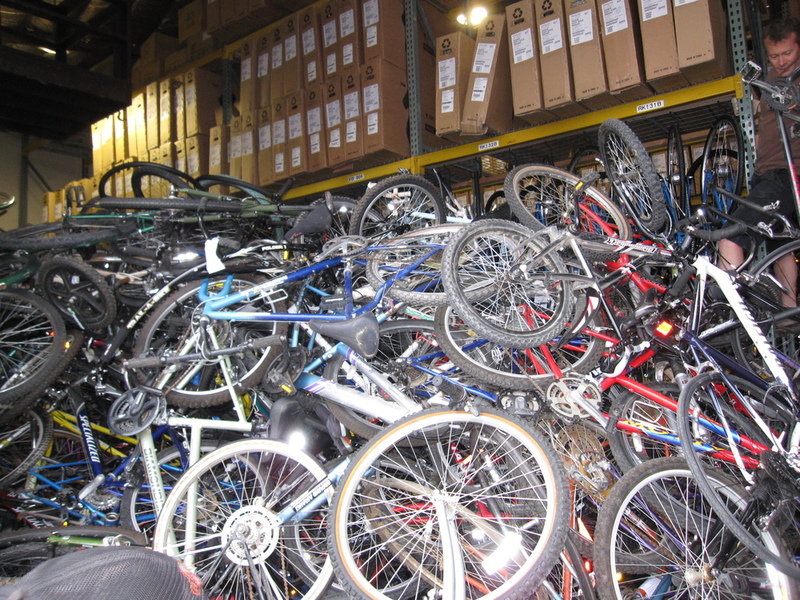 The bike pile was at least ten feet tall, twelve feet wide and thirty feet deep in our warehouse; there were a lot of bikes in that pile. The weather forecast only called for a 20% chance of rain, so despite the ominously dark clouds overhead, we were hopeful we could get it loaded before the cutoff time and stay dry. To pack as many bikes as possible into one container, each bike needs to be prepped: pedals removed, handlebars turned, and some wheels removed, depending on how it will be packed. Tom got this LeMond ready for its trip to Africa. We started at the top of the pile and staged as many bikes as we could fit onto the sidewalk in front of the warehouse while we waited for the empty container to arrive from the Port of Oakland. Jimbo and Sean turning bars. Soon after, the container arrived, along with the rain. As some of the crew started to load bikes, the rest of the crew set up tents to continue prepping bikes as they get pulled from the pile. Staying as dry as possible. This is the ninth container we've sent, and we're getting pretty good at maximizing the number of bikes that will fit, as well as the time it takes to complete the load. Our buddy Sahr from Sierra Leone (now living in Minnesota) taught us the "pancake" method, where the bikes are laid down flat and stacked on their side. Bikes fit in much more efficiently than lining them up, wheels down, in rows. We fill in the extra space at the top with extra wheels, kids bikes, and other small accessories. The first stack is done in the nose of the container. Bikes are staged along the sides of the can, so the loaders can select the bike that will fit best in a particular spot - like Tetris. Thumbs-up from Ken as the first stack takes shape. The kids bikes at bottom right get shoved in the small space at the top of the pile. And as the container reached about half full, the skies opened up and it started to pour. In May? In California? Seriously?? Nick (the guy in the black hat) is loading one of the carbon fiber bikes that got donated this bike drive. These bikes are going to the MK Cycles racing team. When we first started the Africa Bike Drive several years ago, we generally received not-ridden-in-ten-years beaters. Now that the project is maturing, we're getting a greater variety of bikes donated, meaning we can serve a greater variety of riders in Africa. This round of donations, we received six higher-end carbon fiber road bikes, all destined for the cycling team formed by MK Cycles in Zimbabwe, and co-sponsored by our own local racers, Team Mike's Bikes. These kinds of bikes are non-existent in Zimbabwe, and they'll go a long way toward helping the Zim team reach their true potential. After loading the last few things in to the container, we sealed it for the journey to Africa. If anything, the torrential downpour got us working faster. We crammed more than 480 bikes plus parts, wheels, shoes, clothing and accessories into a 40 foot container, in three hours. This load should arrive in Gaborone in about 6 weeks, and will then be distributed to the Sister Shops, each one ending its journey in the hands of a local resident. The drive to collect bikes for Container #10 is already under way. This next one will be our second load bound for Sierra Leone. Please help us spread the word for more tax-deductible bike donations! The Bulawayo cycling season kicked off on February 6th, with a 60 km (37 mile) road race, involving over 30 cyclists. Not surprisingly, our guy Nkulumo came in first; sports pages across Zimbabwe were gushing about his “raw talent” for the following week. The rest of the team didn’t do so bad either. PK came in 6th, Q came in 10th and it is rumored that Godfrey came in 17th.The second race of the Bulawayo racing season was an 50 km (30 mile) off-road race held on February 13th. Not surprisingly, the guys from MK Cycles once again rocked it. First place went to PK, Q came in third. Nkulumo was looking really good, until he snapped his rear derailleur, resulting in him placing seventh. After almost 36 hours of travel, Ken and I arrived safe and sound on Thursday night – just in time to catch the magical 8th inning of Game 2. We wanted to provide some insight into the current political situation and recent history of Zimbabwe but just in case, we decided to wait until we had left. Zim has gone through one of the most spectacular economic collapses in history and while things are moderately stable now, they are a long way from recovery. This basic history is based on many conversations with the people we met there and I have put no effort into verifying any facts (sorry Mugabe, this is what your people are saying…) Zimbabwe is a former British colony that was called Rhodesia (founded by Cecil Rhodes). In the late 70’s, pressure mounted for Zim to gain its independence and after a brief war, they were granted their freedom in ’79. The man who led the fight was Robert Mugabe, the current president. He was hailed as a hero of anti-colonialism all across the region and because of this, he has been given a long leash by his neighbors. The first 18 years with the ZANU-PF party in power were actually quite successful with much investment in the country, building on the foundation of the former colony. Zim was an agricultural powerhouse in the region, had an impressive educational system (literacy rates were among the highest in the world), and was building major infrastructure. The downfall seems to have begun in 1997 and everyone referred to two separate incidents that triggered the collapse. The first had to do with the “Land Redistribution Program” that was meant to return farms and property to black Zimbabweans. As part of the agreement with Britain during independence, the British Government would provide funding to the Zim government so they could purchase farms and land owned by whites and “redistribute” them to blacks. For some reason, the British decided to cut off this funding in 1997, which infuriated Mugabe. His government then went on a systematic and often violent rampage of invading farms and running people off their land. Coincidentally, Milton went to elementary school with the son of the first white farmer who was murdered for his land. The second incident that seems to have started the collapse was a massive payment from the government to “war veterans”. Under immense pressure from these “veterans”, who had a lot of power in the military and police forces, Mugabe agreed to pay $50,000 ZW (Zim Dollars), to 50,000 “veterans”. That equated to about US$3500 to 50,000 people, or US$175,000,000 in total. The government did not have this money, and had little access to foreign borrowing, but Mugabe needed the support of these people to retain his power. Overnight, the Zim dollar (which had been relatively stable for the previous 17 years) lost over half its value. These two incidents led to the massive economic collapse and hyperinflation that Zim experience until 2008. The violent land grab led to massive decline of agriculture since the “farmers” who took over the land had little capital and knowledge to operate a farm. Over this period, Zim went from a place that produced all its own food and exported the excess, to a place with shaky food security and which now relies almost entirely on imports to feed itself. With agriculture, the economy’s engine, in decline and the local currency losing value, the whole country went into a downward spiral. Without going into too much detail, it’s safe to say that all of Mugabe’s attempts to stabilize the situation failed miserably and only led to further collapse and currency devaluation. At its worst, annual inflation exceeded 1,000,000%. Businesses would literally have to change their prices daily. One restaurant owner said he raised his prices three times in one day. Each morning, the Finance Minister would announce the official exchange rate for the day but out on the street, it was changing by the minute. One man we spoke with, who owns a clothing and shoe store, said he would place calls to local forex traders to monitor the rate throughout the day. A new concept in retail sprouted called “replacement costing”. Typically a shop will set its price based on the cost of the item and what the market will bear. This only works when you can reasonably expect to purchase more of that item at nearly the same price. This isn’t the case during hyperinflation. If a shop pays $20 for a shirt and sells it for $40, that’s great unless it will cost the shop $50 to buy the next shirt. So the shop either decides to no longer sell shirts, or it changes the price of the existing shirt to $70, which is the replacement cost plus profit. This just feeds into the endless cycle of hyperinflation. To make matters worse, one official response by the clueless government ministers against hyperinflation was simply to order (by force) that store owners may not increase their prices by more than 30% per month. So, as it was relayed to us, if on the first of the month, a restaurant owner charged $10 for a steak, at the end of the month, that $10 might now be worth only $0.10, making the new currency-adjusted price of the steak $1000. But the restaurant was forbidden to charge more than $10.30 for a $1000 steak. Same as the shirt store, the choice was to lose money on every transaction, or to stop doing business. Anything the ministers did just compounded the problem and accelerated the inflation rate. In one conversation with the joiner, he said he would quote a job in the morning, and when he got paid at the end of the day, it was essentially half of what he quoted. With the value dropping so fast, people dealt with foreign currency whenever possible. This was fine until the government made it illegal to possess anything but Zim dollars. All this did was create a black market for US dollars, SA Rand, or Botswana Pula. Even though it was dangerous, every minute you held on to Zim dollars, you were losing money. One of the worst policies that affected the general population was the withdrawal limits placed on banks. Many people’s salaries were deposited directly to their bank account, and checking and credit card systems were nonexistent, so they were forced to withdraw cash for all daily expenses. But the daily withdrawal limit was so low that, at its worst, it was not even enough for a loaf of bread. Couple that with the fact that salaries weren’t increasing to match inflation and you can see the reason the population plunged into poverty. Another shop owner said he would take his daily sales and go and buy booze and cigarettes since they hold their value. He doesn’t smoke or drink, but he had to get rid of his Zim dollars immediately. The government’s solution was either to print more bills with more zeros (I have a $100 Trillion ZW bill) or to “introduce’ new currency effectively just dropping ‘000’s off. This only caused more havoc and added to the problem. Each person we spoke to would glaze over when telling us these stories. And they all wondered out loud how they made it through. One guy compared it to a woman’s memory of childbirth and how the memory of the pain she experienced gets fuzzy over time. The worst of this period was 2007 and 2008. Businesses that were only allowed to deal in a worthless currency could not buy from other countries. And with the collapse of almost all local production, shelves were empty and the entire country came to a halt. In 2008, the government finally gave in and announced the “Multi Currency System” where the base currency was the USD, but Rand and Pula were also accepted. It instantly stabilized the situation but it stabilized a bad one. Since then, things have gotten marginally better. After each story, we always asked about their feelings towards the future, and unfortunately there’s not a lot of positivity. Mugabe has stubbornly maintained his power throughout, but under allegations of voter intimidation, severe violence against challengers and their supporters, and outright election rigging. Most people are literally just waiting for Mugabe to die, but others are fearful for the people who will surely follow, since the rest of the current government that has been propping Mugabe up are said to be even more ruthless. The opposition party, MDC, is headed by the Prime Minister, Morgan Tsvangirai. After winning at the polls in last year’s elections, he withdrew, accusing ZANU-PF of threatening violence. Under international pressure, the two parties came to an agreement whereby they would share power. Mugabe hasn’t exactly held his end of the bargain and pressure is mounting for yet another “free and fair” election. Apparently Mugabe supports this because the rumor on the street is that he finally wants to hand over power during an election, thereby regaining his international respect . Unfortunately, the rumor that accompanies this is that elements in his own ZANU-PF are unwilling to lose power peacefully and that more violence would surely occur. Through all of this craziness, the people of Zimbabwe are incredible. They remain hopeful for their future, and proud of their nation, despite all its troubles. They are amazingly warm and friendly. They have been through so much hardship that at this point, the general attitude seems to be to shrug (with a smile, even) and admit that there’s not much they can do but make the best of the situation. As one man told us, “Mugabe is in his 80s and I’m in my 30s. I’ll outlive him, and then things will get better.” The people truly deserve better, and they have all the elements to be a great nation again. They only need to be allowed to do it. Although the Joiner is several days behind schedule (big surprise) and hasn’t made much progress since last Friday, we’ve made good progress. We set up the cash wrap area and filled the shelves with stuff to sell. We also set up a desk and workspace for Milton and some parts storage in the back room. The Joiner did come through with the workbenches and the front counter (but of course they’re not finished). So we went to work on setting up the tools on the benches. They’re organized in the typical Mike’s Bikes fashion, each tool wall set up identically, so that any mechanic can work at either bench and the tool placement will be familiar. Up until now, it’s been a cluster. The guys were impressed by this, and a bit surprised – to this point, the tools have been scattered through the store haphazardly with regular shouts of “who has the damn 5 mil?” One guy even commented when he saw the tools all neatly hanging from nails, that he had always wondered what those holes were for. Also, we were able to locate and purchase a 4-way clothing rack and hangers to display the cycling clothing we brought. Buying this thing is a story in itself, but for another time. And lastly, the electrician was able to complete all of the lighting additions so the store is now much brighter. There’s even an impressive bank of lights over the front sidewalk that turns on each night at dusk. With the shop set up as much as possible, we bought pizzas for the crew and it turned into an impromptu store meeting. Milton led the discussion and we spent the early afternoon working with the guys on shop procedures. They learned about how to provide professional customer service and how to be attentive, yet not pushy. Milton gave them some good sales training and spent a lot of time talking about how to describe features and benefits. We reminded them that we were leaving the next day and that both the future of MK Cycles and the growth of cycling in Bulawayo now rests on their shoulders. They’re solid guys and their confidence has grown in just the past few days – we’re sure that they’re up for the challenge. The highlight of the meeting was when we announced an incentive program for Q and Cephas that would be in addition to their salary of $150 per month. Their faces lit up at the prospect of bringing home a couple extra bucks at the end of each day. While they do feel fortunate to have steady employment, an extra $50 at the end of the month can make a big difference in their lifestyle. We also showed them how we use our service tags to write up work orders, and how to keep track of bikes on layaway (called “Lay-Bye” here and very common since the only form of payment is cash, and people can’t walk around with much of it). Lastly, we wanted to make sure before we left that the guys were totally comfortable with all aspects of servicing bikes, so we did a recap of what they’ve learned so far and went over some additional areas. Matt grabbed a bike and went over every adjustment of it, front to back. We then did the typical Mike’s Bikes “show-me” step, handing a bike to each mechanic and having them demonstrate to us that they had fully absorbed the information. We’re happy to report that they all passed with flying colors. Q even pulled us aside later to show how he had nailed yet another difficult derailleur adjustment! Oh my, what a place. After our 1st four days of trying to get things done, we have amassed a sizeable pile of futility and frustration. The most common situation is attempting to purchase things. They only accept cash, mostly US dollars but you can usually pay with SA Rand or Botswana Pula. Somehow, this country acquired US dollars, some of the dingiest bills I’ve ever seen. The problem is they all want small bills but one ever has any change. Of course we brought $100 bills and our typical purchase involves the shop owner sending an employee on a hunt to nearby businesses for change. It has taken up to 30 min to get our change back in some cases. Also, there are no US coins here so all change is dispensed in SA Rand, about 7 to the dollar. All of this makes buying stuff an adventure. Just today I went to buy a coffee. I was ready with $10 bill. It came to $2.63 or $2 US and 5 Rand. I handed over my bill, happy that it was a manageable size. He asked if I had anything smaller and I said no. He opened his cash drawer to see what he had (this was a busy coffee shop, btw) and it was completely empty. No paper, no metal, no nothing. He proceeded to examine it closely and looked at me blankly. He asked if he could bring my change to my table with the coffee. 10 minutes later my coffee arrived with no change… Just before I finished my coffee, he came back with $5 and a pile of Rand. The 2nd most common issue is what we call “Africa Time”. We’ve come to realize that the phrase “I’m on my way” or “he’s on his way” only refers to the fact that someone is aware they have to be somewhere sometime, it does NOT denote the process of movement and impending arrival. Hearing from the joiner that he’s on his way (his shop is 10 min away) could be anywhere from 10 min to 4 hours. Our favorite source of frustration is that things here work… sometimes. Stoplights (called robots here), the internet, electricity are just a few of the wonderful things that come and go throughout the day. Here was the highlight today. Ken went into a computer shop that had a sign saying “WiFi Here”. Ken: Hi, do you have WiFi here? Ken: Ok, can I use it? Clerk: Yes, you need a card. Ken: Ok, can I buy one? Clerk: No, I’m sorry, we’re out. Ken: Ok, I think I have one, is this the right one? Ken: Ok, but I can’t login with it. Clerk: The WiFi isn’t working today. How do we manage you ask? A firm commitment to that staple of bike shop culture, the end of day beer run. Our entrepreneur here in Bulawayo. He has lived in Zimbabwe his whole life. He was born in Marondera, about 10 hrs from Bulawayo. He is 25 yrs old and graduated from Africa University in Mutare. While in college, he started an NGO focusing on improving the lives of the Zim youth. Part of his message was to be entrepreneurial and seek out opportunities. Through a connection to Bones in Botswana, he learned of our project and decided to practice what he was preaching. He is extremely intelligent and motivated and a pleasure to work with. He knows about as much as western pop culture as I do which has led to some spirited discussions about how America really is. He fancies himself a little like 50 Cent and enjoys verbally expressing his toughness. Due to this and his small stature, we have dubbed him “3 Rand” (25 cents converted into South African Rand, the other currency widely accepted here). Cephas and Q are Milton’s employees and two of his cousins. Kefasi is 20 yrs old and Q is 21. They have both learned very quickly and progressed well as mechanics and sales guys. They are still young and have teenager-like tendencies when it comes to getting work done but if Milton stays on them, they should be fine. Mike is the guy that has been helping teach the guys how to wrench. He really is a master mechanic and could start at our shops tomorrow if he were there. His resourcefulness and ability to fix things in the poor condition in which he gets them is astounding. He runs a repair business on the other side of town and has been an incredible help to the guys at MK. He is extremely excited to see what’s happening here and will work well with Milton to grow the cycling community. Godfried is a friend of Q’s and hangs around the shop everyday. When Milton first opened, he let his landlord sell some electrical equipment in exchange for a reduction in rent. Godfried was the guy they hired but since business was less than expected, they have stopped. But the guys here fell in love with him and I think he is hoping to have a job at MK in the future. He works right along side the guys getting paid and always has a smile. He’s also a darn good cook and prepares Sadsa (Zim’s version of Pap andsimilar to our mashed potatoes but from sorghum) and meat for the guys for lunch. These are the two guys who make up the MK Cycles “race team”. PK is the one they call the fastest guy in Zim and Nkulumo trains with him. They ride in the morning, usually between 40 and 60K per day. Then they come hang out at the shop and help. They are both good mechanics and are even better dudes. Both Mike and Milton are trying to support them as best they can but again the lack of supply has been an issue. Someday they hope to travel to S. Africa to compete. Tawanda is the joiner, or skilled contractor, who is doing the work on the shop. He is building workbenches, a display case, and some framing to hang more bikes in the shop. This man can tell a story and won’t stop until you walk away. His last name means ‘one who stops roads’ and it’s one of his better stories. His grandfather lived on some rural property that was between the main road and a school. He was tired of everyone driving through to get to the school so he started making everyone drive around. So they called him Madzivanzira and it stuck. We did a lot today but the shop didn’t look much different. We finalized our deal with the “joiner” – he starts first thing tomorrow morning. We also found and purchased a cash register and some shelving units. One interesting thing here is how you can have stuff delivered. All around town are men with push carts which they call scanias. You can hire one of these guys to meet you where you are buying stuff and have them delivered where you need it (in the city). We bought 4 shelving units that were about 10 ft high and needed to get them across town. They definitely weren’t about to fit in or on our Chevy Spark (can you believe that just about the only two white dudes in town get to drive this? As if we don’t stand out enough…). Ken found a nice man named Nkulumo who picked up the shelves and pushed them to MK Cycles. Well worth his $10 fee. The shelves needed to be cut in half so the shop boys started on that. Ken went to work on some more shelves for the back room while I started in on the bikes with a couple of the mechanics. By the end of the day, we had fixed up about 20 of the bikes from the container and had most of the shelves in place and functional. One of the guys helping out is a young man named Phathisani with racing aspirations (they say he’s the fasted guy in Zim). He was my main mechanic partner today, so much so that he took everything I would start. I’m not sure how it happened but each time I started on something, he would eventually work his way in and next thing I knew, I’m watching him! He was pretty good actually so I didn’t mind. He’s also very skilled on a bike and he would put on a show for us during each test ride. After a terrible night’s sleep (made better by the 4am text updates from my wife about the Giant’s victory in Game 1), we met Milton at the shop. He brought all of his financial docs and started in on some basic accounting. In his first 3 weeks, he’s sold 7 bikes – not bad for minimal marketing. At $850 (expensive given the condition of the city) per month in rent and $550 per month in total salaries (Milton and his two employees), plus smaller fixed costs, we estimated his monthly expenses at about $1800. Using the freight cost of his 400 bike container to calculate the “cost” of the bikes (even though we funded the transport charges), we determined he needs to sell 15 adult bikes and 10 kids per month to break even. This includes a small amount of labor, parts, and accessories. We determined his initial pricing strategy was too high for the market so we decided to lower the adult bike prices to a range of $100 - $400 for an average of $150. We also had a conversation about the repair part of the business and we were asking about the skill level of his mechanics. In one story about how one of the guys fixed a customer’s bottom bracket, Milton told us it’s common for people here to use cooking oil as grease or chain lube. With the lack of proper bicycle supply, the people here have had to make due. Hopefully, MK Cycles can change that and provide proper support. We finished the day with a plan of attack for Monday, when everything opens back up for the week. He needs a proper workspace for repairs and some basic merchandising displays. We started our second day with a trip to Milton’s “warehouse”, or Boz’s garage. That’s where he’s keeping the extra bikes since he can only fit about 70 in the shop. After arriving at the Lodge, we headed over to meet Milton at his shop. We were instantly surprised at how much progress he had made. This is the first shop we’ve done where the container of bikes arrived before us. This will allow us to make much more progress since we won’t be wasting days trying to coordinate the delivery and waiting for it’s arrival. Milton had very impressive signage, apparently a guy walked by one day and said he was a painter. After some negotiating, Milton hired him to paint the storefront. As you can see, he was talented. The painting was all done by hand and his ability to recreate the logo accurately several times was incredible. In addition, Milton had almost 40 bikes prepped and in bike display stands! He found a welder across the street and hired him to build the stands. At this point, Ken and I were very excited because we have 12 days here and Milton already has a functioning shop. After a tour of the shop, we headed over the Arizona Spur Steak Ranch for a beer and to make a plan for the week. 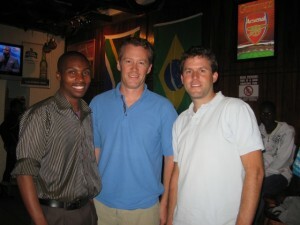 A friend of Milton’s, Munyo, met us for a minute. He was an interesting fellow who works in the local media and apparently he will try to get us some radio and newspaper coverage while we are here. All in all, a great start to the trip. Bicycles are currently fairly uncommon in Zimbabwe. Recently, when a worker from the shop went for a test ride on one of the shop bikes, he was stopped by a police officer and asked for his “cycling license” because the sight of people on bikes is that unusual. By investing seed funding and donating the initial inventory to MK Cycles in Zimbabwe, The Mike's Bikes Foundation aims to create a self-sufficient bicycle shop where none has existed before. This model has already been proved successful in Botswana with the Jonmol Bicycle Service (established 2008) and in rural Namibia at MakVeto Cycles (established 2009). Bicycles, by virtue of being inexpensive to operate and maintain, are ideally suited to address many of the problems facing people in Southern Africa. “By enabling people to buy bikes and get them professionally maintained at a fair price, we are dramatically improving the quality of their lives. Students can get to school, patients can get to the doctor, and merchants can get their wares to their customers with greater ease and zero pollution. The simple introduction of a bicycle can make dramatic improvements in people's lives.” Matt Adams, Co-owner of Mike's Bikes explained the motivations behind the Foundation's projects. Mike's Bikes is the largest independently operated bicycle shop in the US, with eight Northern California locations. Since 2007, Mike's has leveraged their expertise with bicycles to improve life in Africa. Toward the goals of improving people's lives through increasing their access to health care, education and market opportunities for goods and services The Mike's Bikes Foundation was formed in 2008. How to load 395 Bikes (and a ton of components) on a 40ft. Shipping Container from Mike's Bikes on Vimeo. This Wednesday June 9, help us load container #5 in San Rafael! We're loading another container bound for Africa with over 450 bicycles donated by customers on Wednesday, June 9. The container loading will start at 9:00am at 24 Tiburon Street, and volunteers are welcome for any part of the day. This is the fifth container to be sent to the Sister Shop Program by Mike’s Bikes through our bicycle-focused non-profit entity, the Mike’s Bikes Foundation. 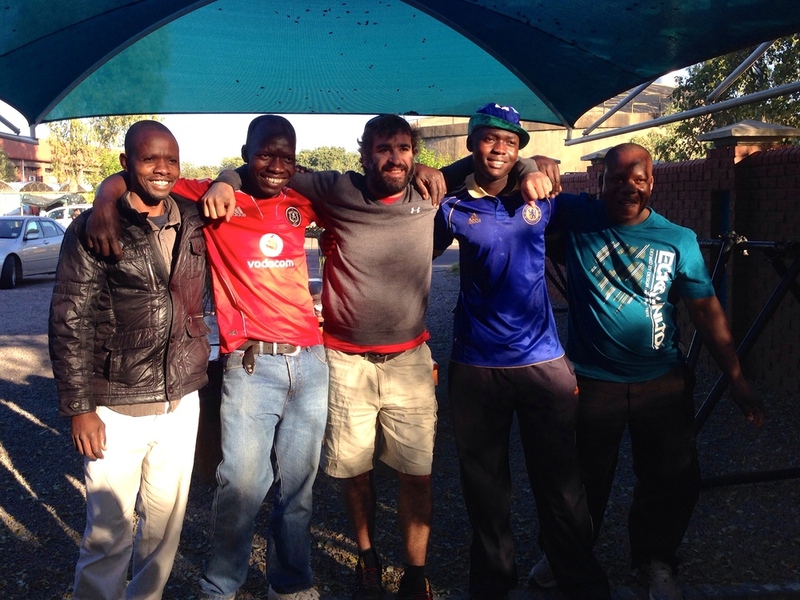 The bikes’ journey to Bulawayo, Zimbabwe will take approximately 8 weeks, and there they will offer their new owners desperately needed access to health care, education, and employment. Collected from customers at all eight Mike's Bikes stores, these donated bikes will be sent to MK Cycles, to be established this year as the third Mike's Bikes Sister Shop in Africa. Mike’s Bikes owners Ken Martin and Matt Adams created the Mike’s Bikes Foundation to realize their goal of creating a self-sustaining source of affordable bicycle transportation in sub-Saharan African communities. Starting in 2008 with their first Sister Shop in Gaborone, Botswana, then continuing to the rural village of Mutjiku, Namibia in 2009, the Foundation is excited to be opening yet another locally-owned source of green, healthy transportation in Africa. Yet internet connections here in Botswana are anything but. I'm posting via text message so the full story from our last two days in Gaborone will have to wait until tomorrow's layover back at the Johannesburg Airport. Suffice to say for now that Bones and his boys have made amazing progress, and also have a very long way to go. We spent all day today attacking the problems and challenges that face a fledgling bicycle store in Botswana. We took plenty of pictures of course, so be sure to tune in tomorrow for a whole bunch of updates. It's bedtime here, and in the morning our all-too-brief stay in Botswana will end with a flight to Windhoek, Namibia by way of Johannesburg, South Africa. Zoom!